Here are a collection of reports and photos from May Day demonstrations around the US contributed by Solidarity comrades who participated. Feel free to add your own report in the comments section below! 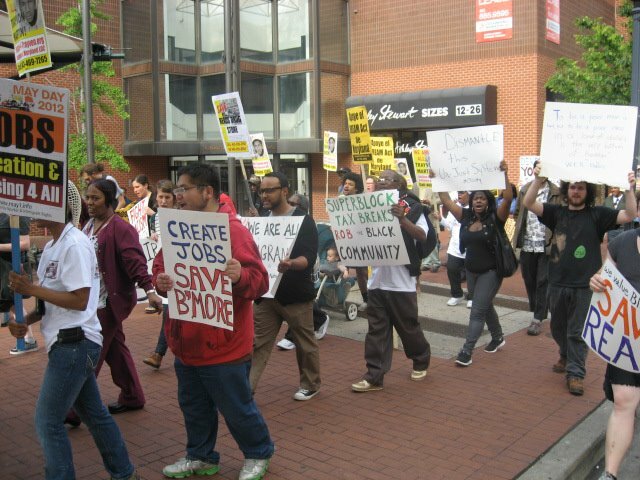 Occupy Baltimore’s May Day was a great success. Feeder marches from the East and West sides converged at McKeldin Square in the Inner Harbor, where the Occupy Baltimore encampment had been before it was cleared out by police. 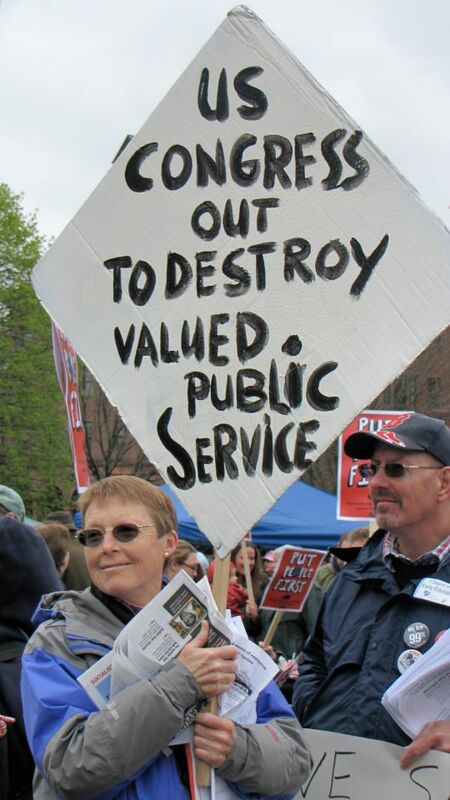 The East Side feeder march met at the city’s main post office; this rally was organized by rank-and-file postal union members and focused on privatization. The West Side feeder march focused on fighting racism, particularly the city’s subsidies for “development” (gentrification) while cutting schools, rec centers, public pools, etc. Thanks to the anti-racist political program, the West Side feeder march was the first multiracial event Occupy Baltimore has had so far. The main rally had at least 250 people, which is pretty big for Baltimore—-more than any Occupy Baltimore demonstration so far. 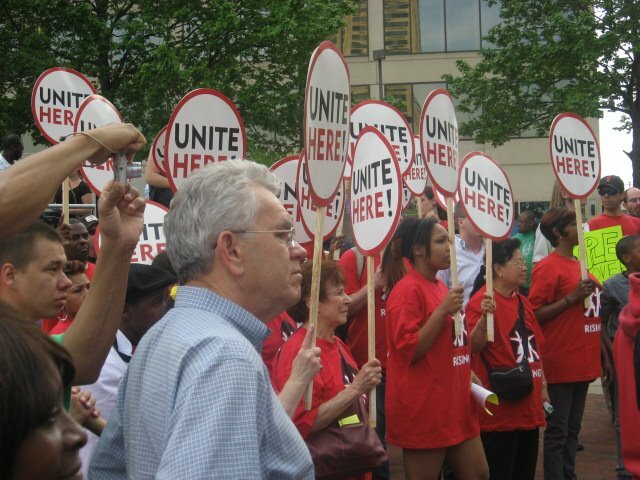 Members of diverse groups spoke, and there was substantial participation by the postal unions, UNITE HERE, Baltimore’s major Latino human rights non-profit, a workers’ center active in the Inner Harbor, and many left groups. Overall this was the largest and most broad-based of any Occupy event I’ve attended in Baltimore so far. After the rally 50 participants marched through downtown to take part in a meeting on the city’s plan to close many rec centers. The march was fairly militant, ignoring commands from police to stay on the sidewalk. Report contributed by Nick, an activist and Solidarity member in Baltimore. About 100 people celebrated May Day, Tuesday, May 1, in Long Beach, California with marches through downtown, a rally and ending with speakers and music, outside city hall, participating were local antiwar groups of Long Beach Area Peace Network, Military Families Speak Out, and Veterans for Peace. The city of Long Beach, with a population about 462,000, is the fifth largest city in California and the second largest in Los Angeles County. Two important industries are the Long Beach Port and tourism. The combined port of Long Beach and Los Angeles is one of the largest complexes in the world. Two marches started from the north and the south. From the north, about 25 people marched from MacArthur Park. While the marchers gathered, six police officers watched. The signs, some marchers carried, said, “Separation of Corporation and State,” “Banks got bailed out–We got sold out!,” “Join a Credit Union!,” and “Honk if you are for equality!” Four marchers carried what was called the “Greed Monster,” made from paper mache, with an oversized mouth and cardboard hands painted with dollar signs. Kayla Crow, a political science and English major, and Jamie McLaugh, also a political science major, estimated about 40-50 students from Cal State University Long Beach left classes before noon, rallied in the Quad and then about 30-40 of them joined the marchers downtown. After food was served at Lincoln Park, the crowd walked to the area between the library and city hall for speeches and music. For a while above the crowd hovered a police helicopter, making it difficult to hear. Outside city hall, Michele Sutter, representing Move to Amend, told the crowd, “This is an emergency. We are here to reclaim democracy. Our democracy is not for sale.” Pat Alviso and Ed Garza, both from Military Families Speak Out, also spoke. Alviso told the audience that $803 billion has been spent on the war in Iraq and another $524 billion has been spent in Afghanistan. She concluded with the old adage that “poor people are killing other poor people for rich people.” Garza pointed out some of the huge salaries of various CEOs from military-industrial complex. Garza, a Vietnam veteran and has friends who have recently died, ended by calling depleted uranium “the new Agent Orange.” He predicted that U.S. veterans who were in the wars of Iraq and Afghanistan will consequently face health problems in the coming years because of their exposure to depleted uranium. Occupy Long Beach (OLB) has reached out in solidarity to labor, unorganized and organized. OLB has begun developing relations with the non-ILWU port workers in the Long Beach and Los Angeles harbors. During the California Nurses Association one day strike of December 23, 2011, while hundreds of nurses and their supporters picketed outside Long Beach Memorial Medical Center and Miller Children’s Hospital, about six OLB members staged a die-in in the medical center lobby and said, through a human microphone, “Something is wrong inside if the nurses are outside, power to the nurses,” before security escorted them out. Meanwhile most recently, about ten OLB activists entered the Hyatt hotel downtown, March 9, and attempted to confront management regarding the city’s $76 million subsidy to the hotel, while local hotel workers and their community supporters picketed outside protesting the hotel’s treatment of its women workers for International Women’s Day, as part of the union’s national boycott. Again security arrived and escorted the activists out with no arrests. Despite the recent efforts of solidarity, the May Day event morphed from a call for general strike, where working people shut down the economy by withholding their labor, either regionally or by industry, into a celebratory and festive commemoration of May Day. Report Contributed by Barry Saks and Erin Foley. Barry Saks is a member of MFSO, the Long Beach Area Peace Network, and Solidarity. Erin Foley is an OLB activist. 2000 strong early educators, postal workers, migrant workers, state employees, students, food and climate justice activists… the 99%, marched in the Put People First March and Rally: One Movement for People and the Planet in Montpelier, Vermont. 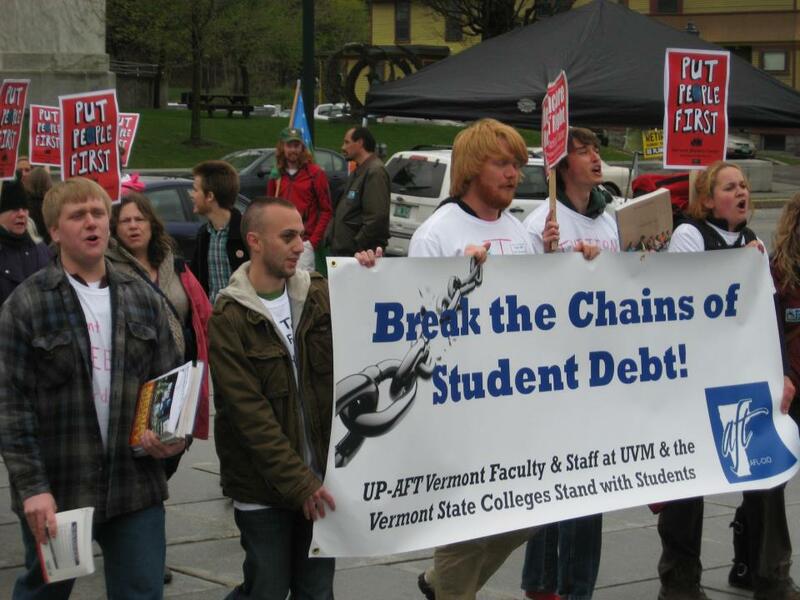 Initiated by the Vermont Workers Center. For the past few years the Workers Center organized May 1st Healthcare is a Human Right Rallies which helped changed what’s politically possible .This May 1st they were joined by Senator Bernie Sanders, Bill McKibben from 350.org, Migrant Justice, climate justice organizers, Abenaki leaders, disability justice organizations, farmers, food justice activists, dozens of Vermont community organizations, and labor unions in a strategic effort to bring our social movements together to build power. The insurance industry, banks and big businesses are mobilizing to undermine Vermont’s move toward universal healthcare and attack our human rights. The May 1st Rally was an opportunity to show our elected representatives and each other that people power is more powerful than their money!